Search and adopt a Cavalier King Charles Spaniel near you. The Cavalier King Charles Spaniel is a small Spaniel type, breed of dog. Considered one of the toy dog breeds, with a substantial silky coat of moderate length, often with a mild wave, and long ears. Four colors (Blenheim, Tricolor, Black and Tan, and Ruby see below*) are recognized. 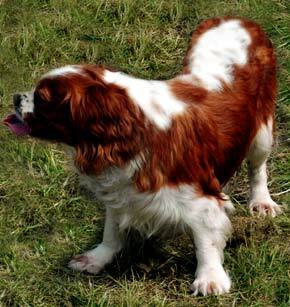 The breed originated in the 20th century though has its roots in the older King Charles Spaniel of the Restoration. The extremely social nature of the Cavalier King Charles Spaniel means that they require almost constant companionship from humans or other dogs. This breed is on top of the list for one of the friendliest in the toy group. It is important for Cavaliers to have been hand-reared as a pup to ensure security and friendliness. They connect with their owners almost immediately, but are a little delayed when a stranger approaches. The Cavalier is intelligent, fun and easy to train. They learn quickly (and remember) the easy commands such as lie down, roll over, and shake within a day or two. With a good treat the complex commands come easily as well. The Cavalier and the Pug is perhaps the largest toy breed: historically a lap dog, modern day fully-grown adults tend to fill a lap rather amply. It is nonetheless quite small for a spaniel, fully-grown Cavaliers roughly comparable in size to adolescents of more conventional spaniel breeds. Breed standards call for a height between 29 and 33-cm (12–13 inches) weight between 4.5 and 8.5 kg (10 and 18 lb. ), although even purebreds commonly grow to 35-40 cm tall with a proportionate weight between 20-25 pounds. Unlike most other spaniels, the Cavalier has a full-length tail, well feathered with long hair, usually not docked, which is typically carried aloft when walking. The Cavalier's head is nearly flat between the ears and has a well-defined nose, its eyes are large and round and giving the dog its characteristic endearing look. Its neck is strong and is slightly arched and the ears are long and drooping with plenty of feathering. The body of the Cavalier is small but well balanced, this dog moves with a somewhat elegant and royal gait. The Cavalier is also very brave. A Cavalier's coat may be beautiful, but, because it can be long, it is very important to keep it well groomed. Daily brushing is recommended to ensure that the coat does not get matted and that foreign objects, such as grass and sticks, do not become entangled in the feathering. It also should not be bathed more than twice a week otherwise it may cause skin irritation. Fur on the feet and on the hind legs should be trimmed regularly. In hot climates, the ears should be thinned. Parti-colors are the colours that include white: Blenheim and Tricolour. Whole-colors have no white: Black and Tan, and Ruby. Blenheim is the most common color. Some Cavaliers have been known to exhibit traits common with cats, like perching in high places (the tops of couches, the highest pillow, etc), cleaning their own paws and also showing some birding qualities. Cavaliers have even been seen catching small birds in mid-flight that are flying too close to the ground. Such behavior is a result of their earlier use as a hunting dog, and as such, they can develop habits that predispose them to chase small animals such as chipmunks, squirrels, rabbits, bird’s etc. Because of this, it is recommended that care should be taken when walking a Cavalier off-leash. They can single-mindedly chase a butterfly or rabbit onto a busy road or other dangerous situation without if not properly trained.